May 1946. 235 The WCTU met May 21, 1946 with Mrs. McCargar. Rev. Leslie McCargar read the devotions, saying in part, "God has a solution. We are find it out. When you have learned the solution, then pray for the courage." Ada Park presented the program on the topic Rehabilitation Program of World's W.C.T.U. 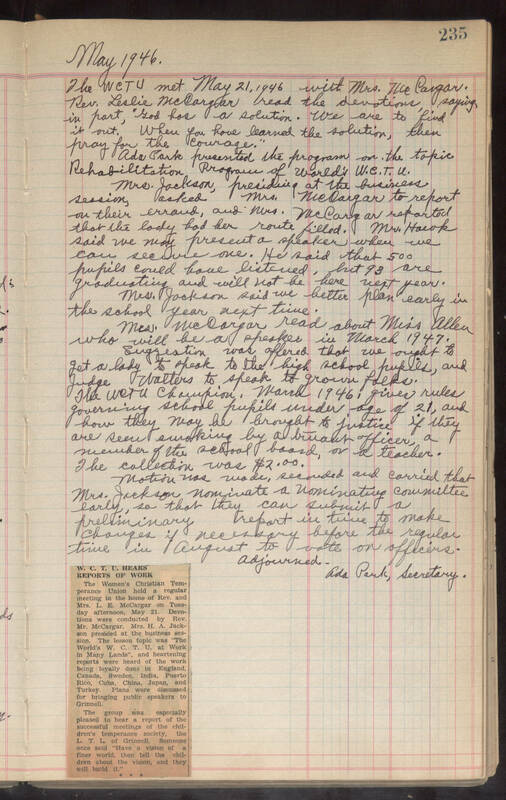 Mrs. Jackson, presiding at the business session, asked Mrs. McCargar reported on their errand, and Mrs. McCargar to reported that the lady had her route filled. Mr. Hawk said we may present a speaker when we can secure one. He said that 500 pupils could have listened, but 93 are graduating and will not be here next year. Mrs. Jackson said we better plan early in the school year next time. Mrs. McCargar read about Miss Allen who will be a speaker in March 1947. Suggestion was offered that we ought to get a lady to speak to the high school pupils, and Judge Walters to speak to grown folks. The WCTU Champion, March 1946, gives rules governing school pupils under age of 21, and are seen smoking by a truant officer, a member of the school board, or a teacher. The collection was $2.00. Motion was made, seconded and carried that Mrs. Jackson nominate a nominating committee early, so that they can submit a preliminary report in time to make changes if necessary before the regular time in August to vote on officers. Adjourned. Ada Park, Secretary. W. C. T. U. HEARS REPORTS OF WORK The Women's Christian Temperance Union held a regular meeting in the home of Rev. and Mrs. L. E. McCargar on Tuesday afternoon, May 21. Devotions were conducted by Rev Mr. McCargar, Mrs. H. A. Jackson presided at the business session. The lesson topic was "The World's W. C. T. U. at Work in Many Lands", and heartening reports were heard of the work being loyally done in England, Canada, Sweden, India, Puerto Rico, Cuba, China, Japan, and Turkey. Plans were discussed for bringing public speakers to Grinnell. The group was especially pleased to hear a report of the successful meetings of the children's temperance society, the L.T.L. of Grinnell. Someone once said "Have a vision of a finer world, then tell the children about the vision, and they will build it."